At the main event of World Wide Developer Conference (WWDC 2014), Apple has officially releases next version of its most advanced mobile operating system iOS Firmware i.e. iOS 8 Firmware for iPhone, iPad and iPod Touch devices. Currently at initial and testing stage, iOS 8 Firmware is available as first beta version update (Build: 12A4265u). Apple iOS users can Download iOS 8 Beta 1 IPSW Firmware for iPhone 5S, iPhone 5C, iPhone 5, iPhone 4S, iPod Touch 5G, iPad Air 5G, iPad 4G, iPad Mini, iPad Mini 2, iPad 3G and iPad 2G via Direct Links available below. The newest and latest version of iOS 8 Firmware comprises with several addition of new, improved and updated features and functionality, bug and error fixes, performance improvements, enhancements and stability issues fixes etc. You can read full official iOS 8 Firmware features and changelog in our previously published post from HERE. 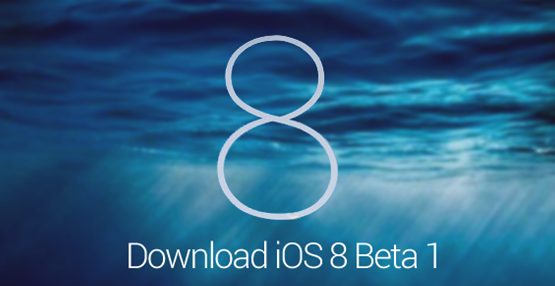 How to Download and Install iOS 8 Beta 1 Firmware Manually? Apple has seeded first beta version of iOS 8 Firmware as pre-release iOS 8 Beta 1 (Build: 12A4265u) for iPhone, iPad and iPod Touch devices. According to Apple, If you update/upgrade your iDevices to iOS 8 beta then you won't be able to restored it to earlier versions of iOS firmwares i.e. iOS 7 or iOS 6 and you must registered your Apple device's UDID in order to install the iOS beta versions. Apple iOS 8.0 Beta 1 Firmware (Build: 12A4265u) will be expires on Wednesday, July 16, 2014 @ 12AM (GMT). 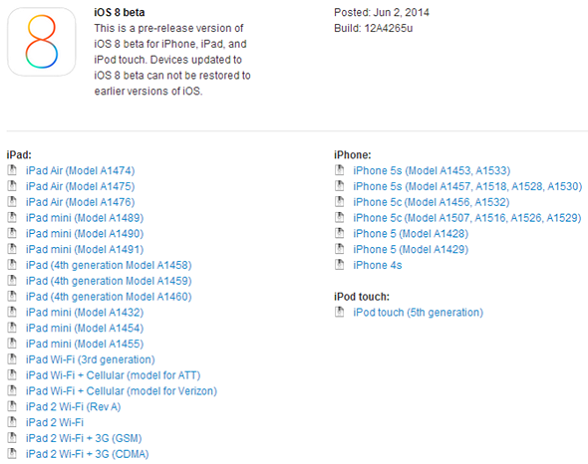 Apple iOS 8 Beta 1 download links are live on Apple’s iOS Dev Center website. If you're iOS developer or non-iOS developer (general public) than you can manually install iOS 8 Beta 1 (Build: 12A4265u) Firmware via iTunes after download the .ipsw files through the Official Direct Download Links of iOS 8 Beta 1 IPSW Firmware for iPhone 5S, iPhone 5C, iPhone 5, iPhone 4S, iPod Touch 5G, iPad Air 5G, iPad 4G, iPad Mini, iPad Mini 2, iPad 3G and iPad 2G. Alternatively, To upgrade/update old iOS 7.1.1 firmware to latest iOS 8 firmware via OTA (Over-the-Air) wireless process, then just head over to Settings > General > Software Update option within your iPhone, iPad and iPod Touch devices. If you're not sure about your Apple device Model Number then please look at the back of your iPhone, iPad or iPod Touch devices, Or click the link to check Model Number of iPhone and Model Number of iPad. Currently, No official Untethered iOS 8 Beta Jailbreak is available via Evasi0n8 jailbreak tool. It's expected to be released soon by team evad3rs. Stay tuned with us! Note: Download Apple iOS 8 Final Version (Build: 12A365) for iPhone, iPad, iPod Touch and Apple TV officially HERE. NOTE: You can still Install and Activate iOS 8 Beta Firmware without having Apple UDID Registered and without having iOS Developer Accounts, Click Here to know how!